Chalking is a common occurrence on Tech’s campus; from alerts for club meetings to punnily phrased invitations to major events, this colorful, yet washable graffiti can be seen up and down the main sidewalks. Rarely, though, does chalking carry the impact that it did on October 10, 2014. Students from all around campus wrote their names, inspiring messages or even just creative doodles to speak out for the LGBTQIA community on campus. “My favorite part was the creativity shown by Tech students,” said Alex Berry, 3rd year ISyE major and SGA Junior Class President and co-chair of SGA’s Cultural and Diversity Affairs Committee. Berry, though, says his favorite chalking design was the creation of a “Rainbow Road” which, according to him, was especially interesting due to some situational irony because many of the off campus demonstrators had to walk on a “rainbow-filled path” to get to Tech’s Free Speech Amphitheater. The event lasted from 11 a.m. to 4 p.m., and during that time, hundreds of students showed their support. The success of the event surprised even its organizer, the Cultural and Diversity Affairs Committee under SGA. “…the success [of the chalking event] was dependent on the enthusiasm of the committee and of Tech students,” said Berry. Although the event was organized by SGA, it was still in many ways a grassroots demonstration. Because there was such a short turn around between the time SGA began planning the event and the time it took place (just 48 hours), much of the marketing for the chalking was done over social media or by word of mouth. 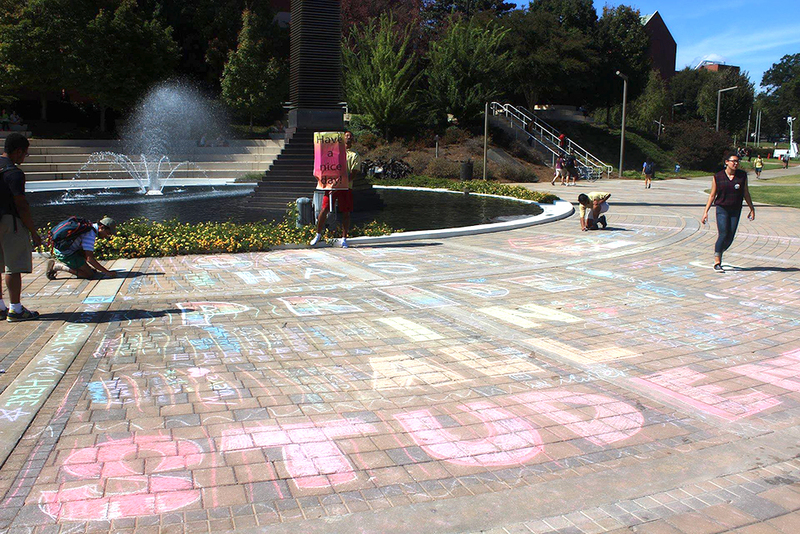 Even more, though, many students noticed the chalking event due to its location at the Campanile. This, according to Berry, also helped the event grow and reach other students. “The response we had made my day. It actually made me happy for a good couple of days,” said Cheyne. SGA’s goal was to engage Tech students in a relevant way that was more than just tabling or regular office hours. Next time, Cheyne hopes to add more decorations, music and even lighting up the Campanile. While there are no immediate plans for a similar event in the future, Berry and others do hope that the chalking it is continued.